Several recently released products make their debut on the latest weekly US Mint numismatic sales report. This includes the 2013 Uncirculated Coin Set, 2013-P Perry’s Victory and International Peace Memorial Five Ounce Silver Coin, and 2013-W Uncirculated Gold Eagle. The 2013 West Point Silver Eagle Set concluded sales during the period covered by the report, with a surge in last minute orders. The 2013 Uncirculated Coin Set or “2013 Mint Set” went on sale June 4, 2013. Each set includes 14 uncirculated coins each from the Philadelphia and Denver Mints packaged in two separate folders. This represents one of the Mint’s three core annual set offerings that enjoy broad popularity with collectors. Through the reporting date of June 10, sales have reached 157,783 units. This represents a slightly slower start compared to last year’s set which had debuted at 164,459 units. On June 6, the US Mint began sales of the 2013-P Perry’s Victory Five Ounce Silver Uncirculated Coin. Sales for this offering opened at 7,966 units, which is sharply lower compared to the opening for the previously released coin of the series featuring White Mountain National Park, which had debuted at 10,605 units. 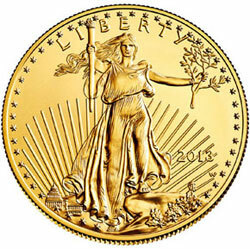 Also on June 6, sales opened for the 2013-W Uncirculated Gold Eagle. This one ounce 22 karat gold coin represents a collectible uncirculated version with the “W” mint mark. Through the reporting date, orders have been received for 1,448 coins. This was slower compared to the debut for last year’s coin, which had opened at 1,949. However, as we have seen for some other recent gold numismatic offerings, collectors may be waiting to place orders in the event of a price decrease this week. The US Mint adjusts prices for gold and platinum numismatic products as frequently as weekly based on the average market prices of the metals. Gold has slipped below the $1,400 level, creating the possibility for a price decrease tomorrow. The four-week ordering window has now closed for the 2013 West Point Silver Eagle Set. This product contains reverse proof and collectible uncirculated versions of the American Silver Eagle struck at the West Point Mint. A surge in late orders brought the cumulative sales total for the set to 281,310 units. I’m waiting, waa-aiting, patiently to pull the trigger on 2 out of 3 1oz gold coins! Buff + Unc. By my calculations, London PM fix would have to close at 1457.00 for gold just to keep the current price range for gold products. The mint will decrease gold prices today. To correct myself, gold only had to stay above $1400.00 to maintain current price levels. London PM fix $1382.75. Mint has decreased gold prices. Watching Au & Pt prices that seem to be trending lower. Was able to cancel order placed for the unc Au AE in time to avoid paying $50 more per coin than the current price. Going into a wait & see mode for now. First spouses must be playing hard to get.